ACK! ACK! ACK! We come in peace! I can’t pretend to understand the recent reemergence of Mars Attacks. The 1996 Tim Burton film, which fizzled and was quickly forgotten, was based on the ‘60s-era Topps trading cards that no one remembers. And yet, Mars Attacks is back, most prominently in a new board game blitz from Steve Jackson Games. And hey, I can dig some humor at the expense of our future Martian overlords. 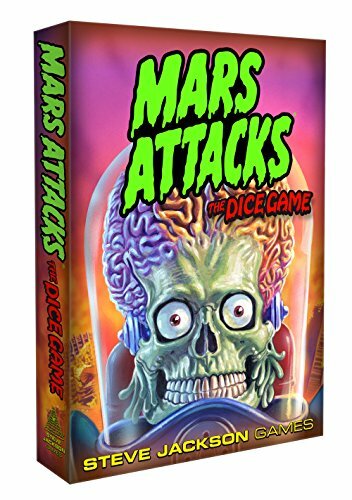 Mars Attacks: The Dice Game is a short and enjoyable casual game of chucking custom dice in an attempt to destroy American cities and landmarks. Yes, you get to be the Martians in this game and good ol’ US of A doesn’t stand a chance. Whenever you roll a die, there are three possible results: A ray gun, an alien face, or a nuke. Nukes are bad for you. They represent America’s only sensible response to alien invasion. Ray guns help you conquer most cities (with a few exceptions). Get enough and that’s one less American city to worry about. Martian heads can be rerolled, though you could end up rolling nukes (which can end your turn). And landmarks can only be captured with those Martian mugs. Some cards have a nuke symbol on them. That’s good news for you, because these cards “absorb” nuclear fallout. You place any nukes in these spots. But once you run out of spots to place nuclear dice, well, then you're done and any progress you made on your turn is nullified. Mars Attacks: The Dice Game is essentially a press your luck challenge. You rarely will get enough symbols on your first roll of dice, but do you want to take a risk and re-roll those Martian faces? Sure, there are a few other wrinkles – some cards have text that activate special actions when acquired – but it’s a pretty basic game. Short and sweet and good for a couple of chuckles. I remember liking Mars Attacks when I was younger, but it doesn’t hold any special place in my heart. Pick one of the three available city/landmark cards to target this turn. Place all nukes in available nuke spots on cards. If you run out of nuke spaces, your turn is over. Place any dice that match the symbols on the card you’ve targeted. Choose to reroll any dice with Martian icons showing. If you decide to end your turn instead, place a marker where your progress stopped on the card. If you fill up a card with correct symbols, you earn the card (and it’s victory points). Play continues until all cards on one of the three stacks runs out. Player with the most Victory Points from collected cards wins. A slightly more involved version of Zombie Dice. You roll a bunch of nukes, but it’s on the one card that requires you to roll nukes to claim it. I’ve been working on a card and having poor luck, but I’m just one icon away… and then someone else swoops in and wins the card before I can complete it. There’s a poor printing job on one of my dice, but otherwise they look good. The cards have nice art on them and are an unusual size, making them feel a bit unique. Mars Attacks: The Dice Game is priced right for what you get. One minute. It’s super easy to learn. Martians don’t drink. But you’re not actually a Martian, so sure! Set up in two minutes, toss back in the box in 30 seconds. Low stress and good fun. Not a game I’d pull off the shelf very often. It’s not uncommon for your first roll to also end your turn. You like Zombie Dice but want something a little more advanced. You need something to serve as a 30-minute filler game. You’re that one person who remembers the Mars Attacks Topps trading cards from 1962. Questions about Mars Attacks: The Dice Game? Ask in the comments. Played Mars Attacks: The Dice Game and have your own opinion? Tell us! We may feature you in the Dog and Thimble Podcast.